I went with my son to make some visits and we were riding the horse. It was late when we were coming back. The Moon was young, and I couldn’t see anything. By accident I hit a tree with a wasp honeycomb on it. The tree was thin so it shook the honeycomb. The wasps woke up being disturbed and surrounded me. I implored Saint Quiteria so that the wasps wouldn’t attack us. 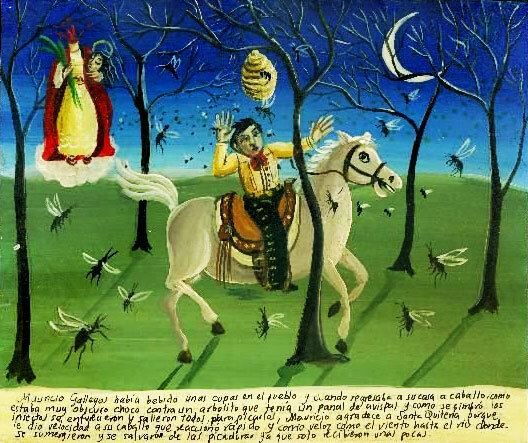 The saint protected us, and the wasps didn’t touch me or the horse. I thank for this miracle. 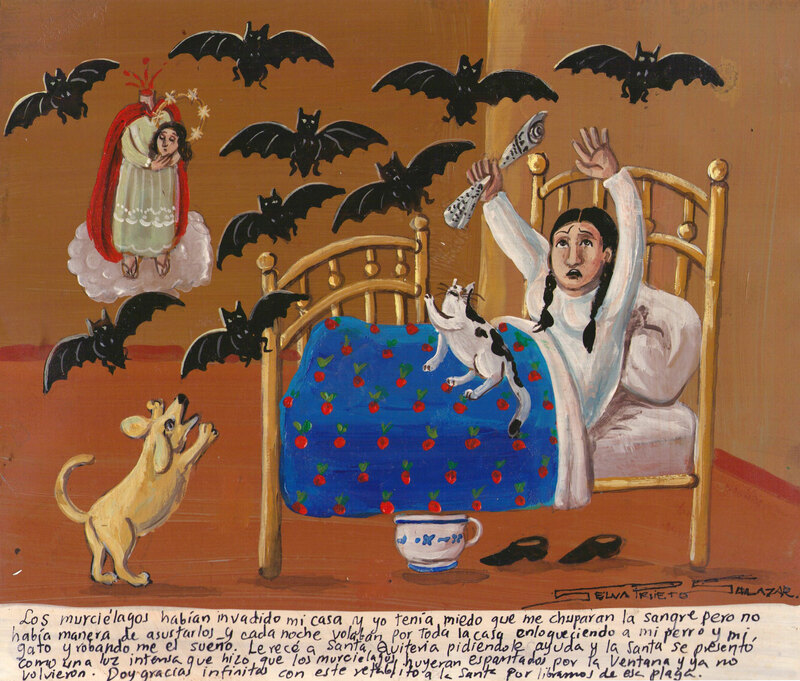 June 25, 1965, Emelia Ramirez went to sell some embroidered blankets. When she cane to the patio of a big house she was immediately attacked by loads of furious geese. They tried to bite her, and, fearing that they might bite her baby, she prayed Saint Quiteria. 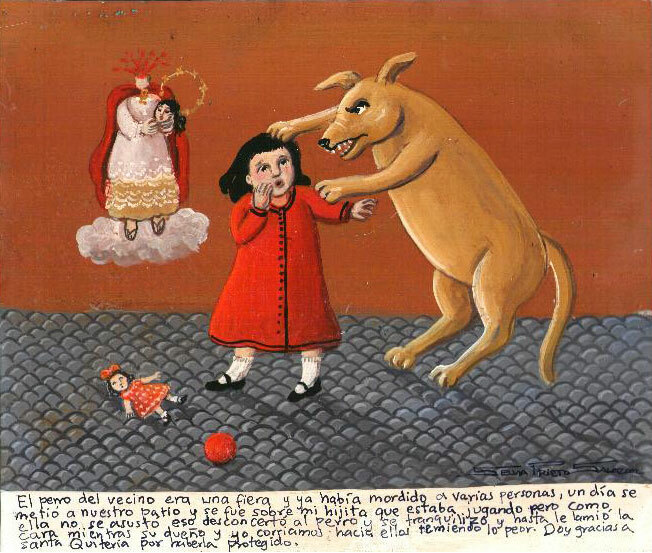 The saint helped her to escape to the street with only two bites on her legs but none to the baby, for which she dedicates this retablo. I was coming back from the market and saw a pair of dogs that cornered two cats in an alley. The cats’ hair stood up, and they didn’t know where to run. I quickly grabbed them and ran away, and the dogs ran after us. I thank Saint Quiteria for we got into the church before the dogs attacked us. 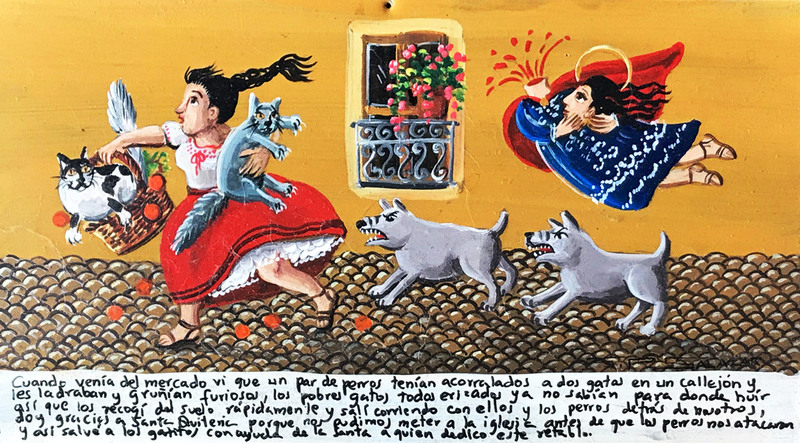 So I saved the cats, with the help of the saint to whom I dedicate this retablo. It was very hot, and the *** sisters went to the river to refresh. Then they noticed a pair of crocodiles approaching toward them. They were scared and implored Saint Quiteria. Thanks to her a young man who was spying on the sisters came to save them. The neighbor’s dog was very angry and had already bitten few people. One day it came to our yard and approached my daughter who was playing. My daughter didn’t get scared, and it discouraged and calmed the dog. The dog even licked my daughter’s face. Meanwhile, the dog owner and me were running towards them in fear of something bad could happen. I thank Saint Quiteria for protecting my daughter. 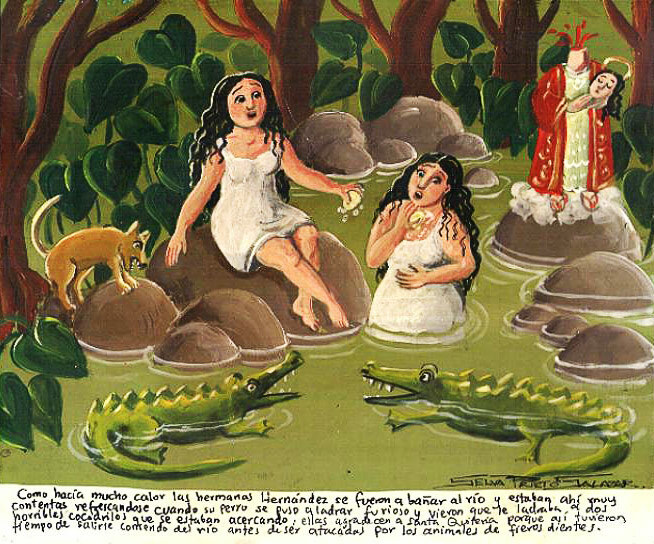 It was a very hot day, and the Hernandez sisters went to swim in the river. They were happily refreshing in the water, when suddenly their dog started barking furiously. Then they saw two horrible crocodiles approaching them. 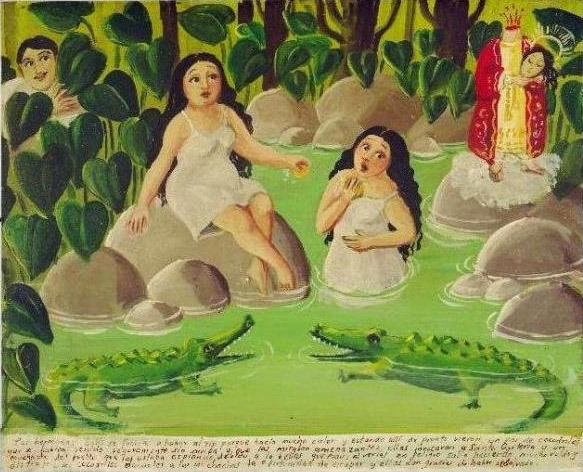 The sisters thank Saint Quiteria for they ran out of the river before being attacked by those fierce-toothed creatures. 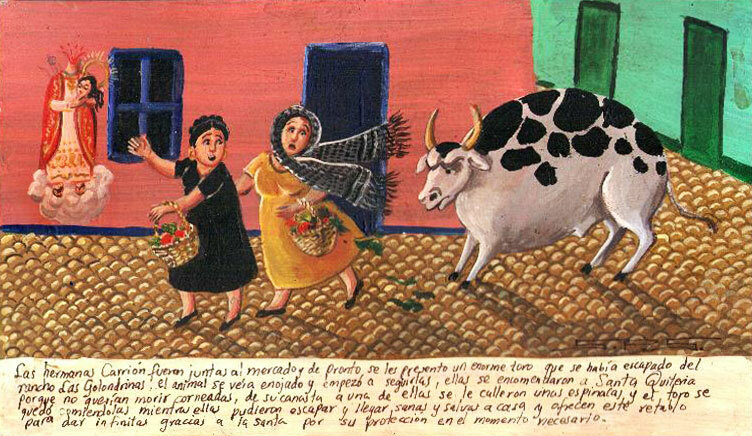 The Carrion sisters were passing by the market when suddenly they saw an enormous bull which had escaped from the Las Golodrinas ranch. 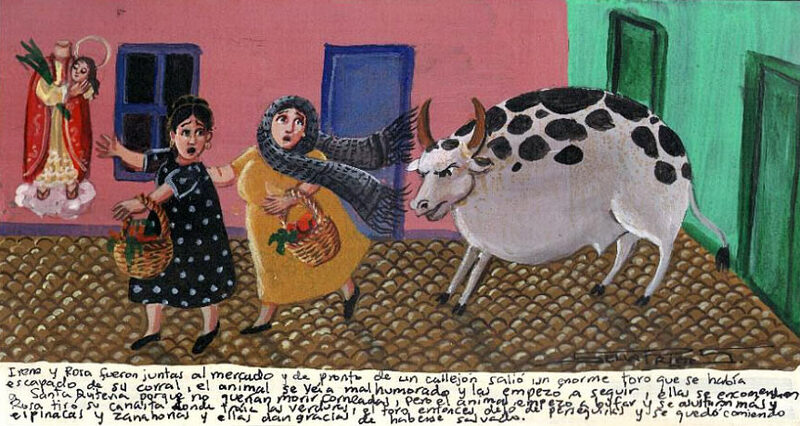 The animal was furious and began chasing the sisters. 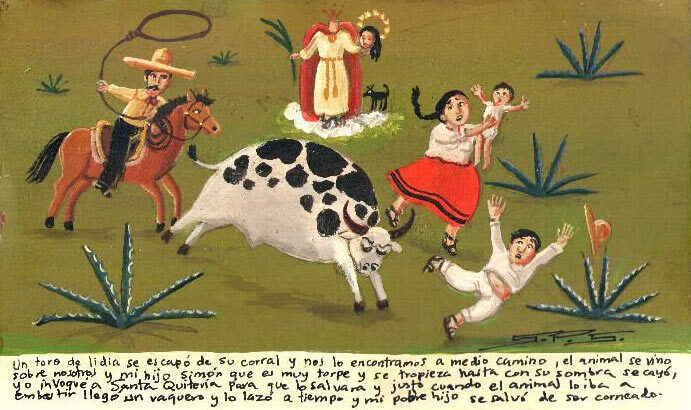 They didn’t want to die from the bull’s horns so they prayed to Saint Quiteria. That moment, some spinach fell of the basket of one sister, and the bull stopped to eat it. The sisters managed to escape and arrive to their house safe and sound. 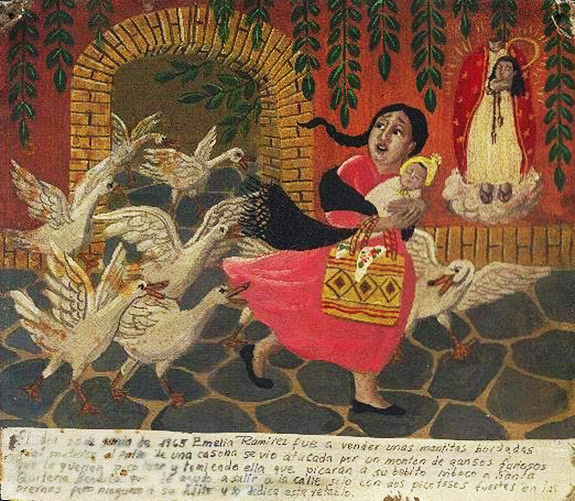 They offer this retablo for her protection in need. Mauricio Gallegos had some shots of tequila in the town. 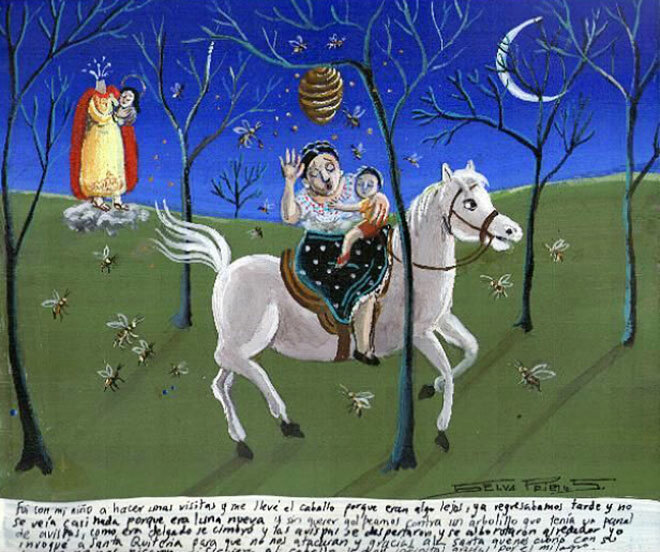 On his way back home he rode his horse and, since it was very dark, hit a wasp nest. The insects were furious. They got out and start stinging him. He thanks Saint Quiteria for she gave extra speed to his horse so it ran like the wind to the river. They submerged in it and saved themselves from the wasp stings. They got only few stings. 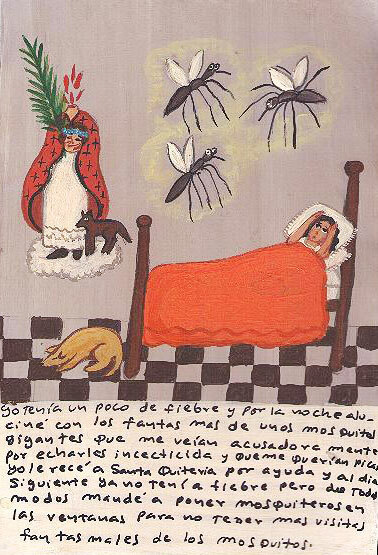 I had a slight fever, And the night I had hallucinations with the ghosts of enormous mosquitos. They were looking at me reproachfully, because I had sprayed insecticide on them. They wanted to bite me. I prayed Saint Quiteria for help, and the next day I had no fever. However I ordered to put mosquito nets on all the windows, because I didn’t want to have any more visits from the mosquitos ghosts. When I was coming back from the market I saw two dogs cornered two cats in an alley. The dogs were barking and grunting ferociously. The poor cats had no way to run. I came quickly, grab the cats and ran away. The dogs went after us, but thanks to Saint Quiteria I was able to run into the church before we were attacked. 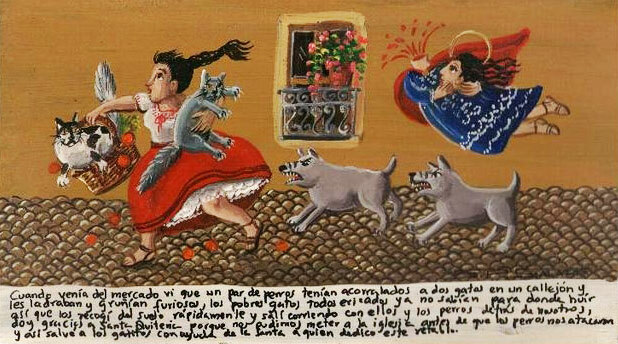 With the saint’s help I saved the cats, and I dedicate her this retablo.